Online ATM Card request and delivery system with tracker is a system designed to assist bank customers and financial institutions computerize the process of customers requesting for Automated Teller Machines (ATM) cards and verifying the customers’ records with an embedded tracker to speed up the process considering the problems faced by doing this manually. The system was studied and relevant officials were interviewed to acquire the required data. This designed system allows for easy retrieval of information that is accurate for effective and efficient allocations of ATM cards to financial institutions customers. It has easy maintenance of information as well as time saving and reduction in operation. The system designed in HTML, CSS, MYSQL and PHP is interactive, menu-driven and user friendly. It provides timely information about customers without their ATM cards. Most ATM operations are recorded and stored in the computer and retrieved as will. 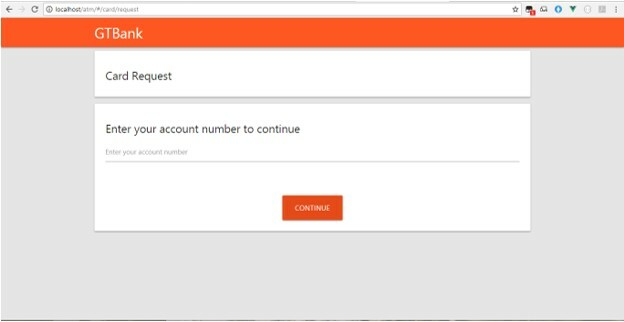 It ensures security as users must just request once before the issue of the ATM Card. The evolution of payments in recent history has gone from cash to cheques, and then to payment cards such as credit cards and debit cards. Interestingly, ATM cards are the most rapidly growing method of payments in several countries around the world. Information and communication technology (ICT) have also provided new products and value-added services to be delivered using the same electronic infrastructure. In order to remain competitive, most companies invest a lot of money in modern ICT infrastructure. ICT has also changed drastically the way businesses are done in these modern times. In recent years, the use of different channels for banking and financial services has changed the whole way bank customers and their banks interact. With the increasing popularity of the internet, more and more industries are seeking ways to utilize this popular medium in an effort to keep up with the changing technological preferences of their customers. These days you can do just about anything online from grocery shopping to making a free phone call to a friend in Tokyo through your PC. The possibilities of the internet are seemingly endless and the banking industry has decided that it will not be left behind. While most people have at least heard of online banking, the majority of them have probably not tried it yet. Maybe it's because we find more comfort in working with real people and real paper when it comes to money matters rather than performing transactions in the seemingly impersonal universe of the World Wide Web. A number of authors and experts have defined e-banking services as a contemporary facility that provides conventional bank products and services through a new medium i.e. IT. It is entirely automated facility based on IT delivery mechanism to conventional banking users’ products and services. It provides online medium of conducting and providing various banking services, such as, online accessibility of bank account, online fund transfer facility, online bills paying facility etc. The benefits provided by e-banking medium have resulted into swift growth of banking sector worldwide. The internet facility has transformed the business world in terms of managing business. According to Abu Shanab et al. (2010), internet has transformed the entire business pattern for people as well as for businesses. Although, technological advancements are happening everyday but not every advancement has been welcomed and adapted by financial sector; but financial sector that enjoying advantages of this new mode of service delivery, has adapted the e-banking phenomenon from its introduction only. Originally it was used for online banking promotional activities of their products and services; but as the e-banking concept developed, banks have started enjoying its various other advantages, such as, reduced per transaction cost, enhanced customer service, raised long term returns by providing ‘anytime anywhere’ banking to the banking customers. Technological advancement specifically, in IT is always seen as the main source of changes taking place around the globe. The entire banking industry has entered into an unparalleled competitive form facilitated by new ICT infrastructure, because of universal and gradual development of ICT. The development of banking ATMs (Automatic Teller Machines) industry has received much attention in recent years, mainly due to growing ATM networks. Recent scholarship has studied whether its growth has maximized consumer welfare. The concern is rooted in the network effects that depend on total number of users or customers patronizing banking ATMs. Because the form of banking ATMs of both banking cards for depositors and differentiated banking ATMs can be regarded as network effects. 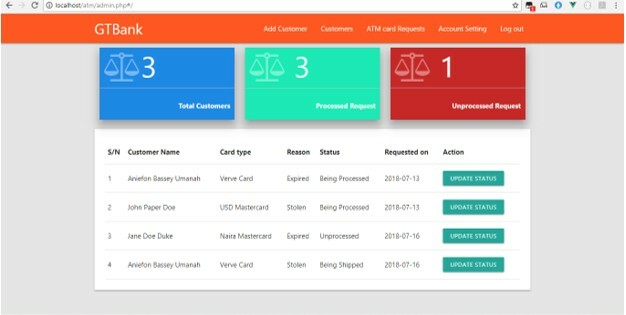 Online ATM card request and delivery System with tracker is an application which generally allows bank customers apply for Automated Teller Machines cards used to withdraw money at ATM machines or perform cashless transactions without visiting the bank, This application will be used by financial Institutions (Banks) to create and manage customers ATM card request using a computerized system where the customers can apply for their ATM cards anywhere in the world, without visiting the bank and more importantly verify and speed up the request time for getting the ATM card with a tracker, to aid speed up of the entire process, with this computerized system there will be no queues in banks, no hassle and stress to get ATM cards from our banks across the country. 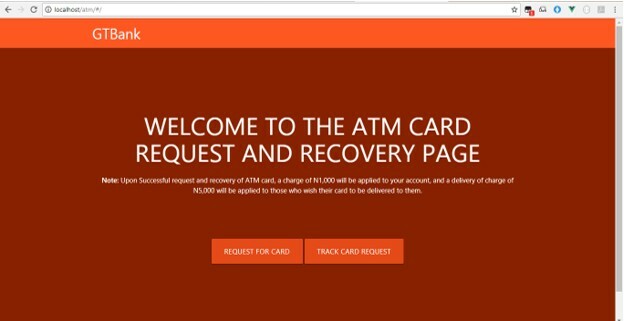 If a customer needs an ATM card to perform cashless transactions, the customer is able to apply for this card over the web without visiting the bank, all these modules are able to help the bank to manage and create an ATM for customers with more convenience and in a more efficient way and it also help in the cashless policy initiated by the central bank of Nigeria. To resolve the issue of manual application of ATM Cards. To provide a platform for bank customers to request and speed up the collection of ATM Cards in a secured environment. To design and implement a system where Bank Customers can easily track their ATM card request application. To aid financial institutions perform at their best with the use of modern digital ways to speed up service delivery. To easily confirm the authenticity of any customers’ ATM Card. The problems found during customers’ application for ATM cards was so much that there were cases of customers spending lot of time in bank queues in order to get their ATM cards, Lack of effectiveness in their methods of keeping customers ATM application records and long days before the ATM cards is finally issued, further compounds the problem. The study will contribute immensely to the banking sector of Nigeria especially, in the area of ATM card request and delivery. With the proposed technology, bank customers will request for AT cards at their convenience in a secured manner. The study will also serve as a foundation for other student researchers who have keen interest in the subject matter. - ATM Card- is a payment card or dedicated card or dedicated payment card issued by a financial institution which enables a customer to access automated teller machines. - Tracker- system used to observe of person or objects on the move and supplying a timely ordered sequence of location data for further processing. - Customers- a party that receives or consumes products (goods or services) and has the ability to choose between different products and suppliers. - Financial institution - A financial institution (FI) is a company engaged in the business of dealing with financial and monetary transactions, such as deposits, loans, investments and currency exchange. 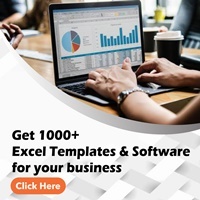 - Computerized – equipping something with or the usage of and associated automation by computers and software. - Operation – an act or instance, process, or manner of functioning or operating. - Manually- by hand rather than automatically or electronically. - e-banking- Online banking also known as internet banking, it is an electronic payment system that enables customers of a bank or other financial institution to conduct a range of financial transactions through the financial institution website. - Records - to set down in writing or keep evidence of something.